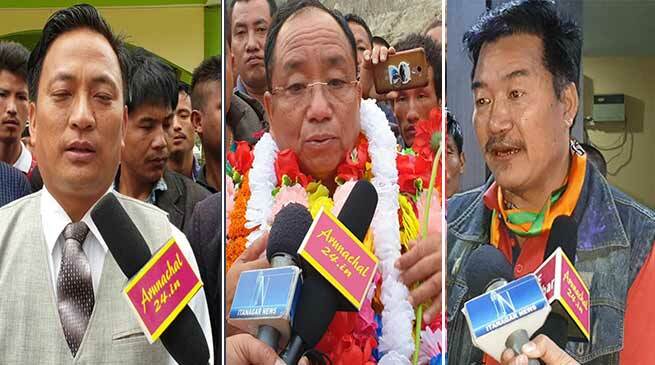 Itanagar Constituency has triangular fight among BJP candidate Kipa Babu, INC candidate Ymlang Achung and JDU candidate Techi Kaso . The Bharatiya Janata Party (BJP) declared the remaining six tickets on Thursday and prompted sitting MLA of Itanagar assembly constituency, Techi Kaso to resign from the party. Without mincing any words, Kaso, in his resignation letter cited the denial of party ticket as the reason for his resignation. He informed that he will now be contesting for the Itanagar seat from the Janata Dal (United). Several other party leaders and workers, who were supporters of Kaso, also resigned from the party on the same day. More are expected to follow suit. On receiving the BJP ticket from Itanagar seat, former MLA Kipa Babu said that his “good track record” has earned him the ticket. “When I was the MLA from 2004 to 09, I made sure that law and order situation was well-maintained. The people’s trust in me may have prompted the party leaders to give me the BJP ticket,” he said. While Babu said that the exit of several party leaders was their individual decision, he appealed to all workers and leaders to trust the party leadership and work together to make sure that the party comes out victorious in the 2019 elections. His services as IMWA president is known to the business communities and other people of twin city may also understand my service and assumed to work for several public services including development and beatification of township. Achung added.